Herb Blurb July 2018 - Summer in Colorado is in full swing! The Herbalist’s Happy Hour, Crafted Cocktails and Tapas from the Garden is finished! I will be sending out a separate, short email once it is officially up on Amazon. If you plan on coming to any upcoming classes I will have copies of the book with me. The book includes recipes for fresh, artisanal beverages and finger foods made with ingredients from the garden. I went for low effort and delicious results. It includes recipes for cocktails, infused liquors, non-alcoholic refreshers, bitters, garnishes, savory small bites and more. From Blueberry Basil Blast to Smoked Salmon Mousse you’ll find plenty of ideas for healthy hydrating and flavorful snacking. You all need this book! It’s the best month for alpine wildflower viewing. Get out and take a hike in the cool of the mountains for beautiful vistas. There are music festivals from Denver Post’s Underground Music Showcase, https://www.undergroundmusicshowcase.com/, to concerts at Red Rocks, the Botanic Gardens, Hudson Gardens and free concerts in the parks, providing plenty of opportunity for dancing in the streets. Here is an article on local summer freebies: https://theknow.denverpost.com/2018/05/05/outdoor-summer-concerts-denver/183485/. Check https://www.colorado.com/events for a full list of statewide events. Get out there and celebrate the apex of summer! I will be teaching several classes at the Crested Butte Wildflower Festival this month. A great time in a truly gorgeous location. Check http://www.crestedbuttewildflowerfestival.com for info on a wide arrange of classes and events. Learn how to use this aromatic herb in everything from desserts to cocktails, infused salts and sugars, vinegars and sauces. Discover how to keep your dishes from tasting like a bowl of potpourri. Take home a sample of Herbes de Provence seasoning blend to get you started and snack on some delicious lavender shortbread cookies and lavender lemonade while we explore the culinary uses of this lovely plant. Recipes included. * This class takes place during Lavender Festival, an all-day event at Chatfield Farms featuring lavender products made by local growers and artisans available for purchase, free demonstrations, live music and a variety of food, dessert and drink vendors. Location is Chatfield Farms south of C470 and Wadsworth. Spend a morning learning and crafting with this delightful herb and end with a scrumptious lavender themed lunch. Discover the many health and wellness properties of this easy to grow plant. We’ll make and take home samples of Herbes de Provence seasoning blend, soothing lavender/calendula lip balm, conditioning herbal hair rinse, fragrant lavender sachets to scent drawers or to use in the dryer, and a refreshing facial toner. Recipes, luncheon and take home samples included. Wondering what to do with all those fragrant herbs languishing in your garden? Learn how to preserve your herbal harvest in elegant vinegars, herb butters, herb salts, sugars and seasoning blends, marinated cheeses, robust pestos and spicy salsas. Turn your daily fare into something special. Go home inspired with new ways to implement the healthy and delicious flavors of your garden bounty. Generous sample tastings, recipes, and growing and harvesting tips included. Get that winter pantry started! Demonstration class. With the high temperatures and low humidity make sure your garden is getting enough water. My favorite time to water is after dinner. It gives the plants a chance to really soak up the moisture and start fresh the next morning. If you haven’t mulched, do it now. It will cut down on watering and weeds. I mulch all my container gardens with Spanish moss which really helps to retain moisture. You can find it in bags in the artificial flower sections of craft stores. Cut back spent flowers and rangy plants to keep them tight and full of blooms. If the garden is looking a little weary, give it a shot of fertilizer to perk things up. Replant basil and cilantro every 2 to 3 weeks to keep a fresh, vibrant supply. Time to start drying your herbs for your winter pantry. 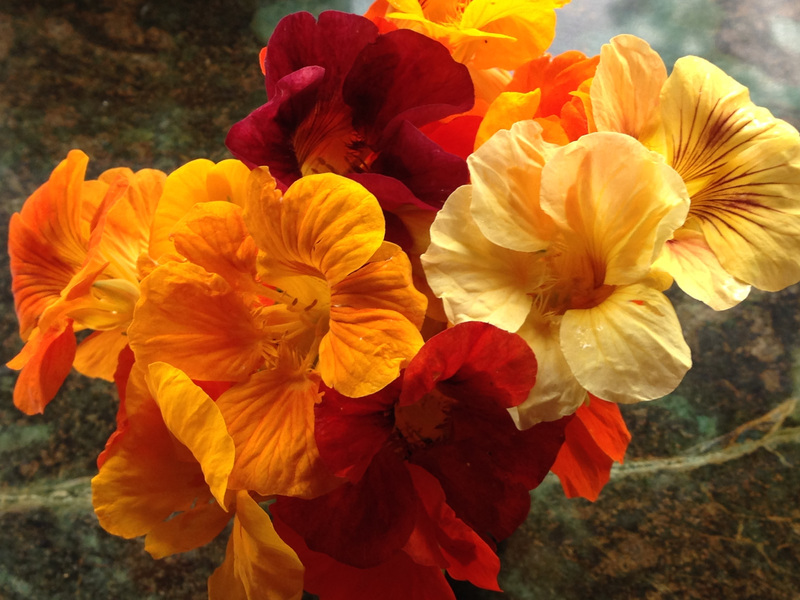 Nasturtiums are one of my favorite edible flowers. This easy to grow, fragrant and tasty little plant is a must for every sunny garden. The flowers come in hot colors from red to orange to pinks and yellows. It likes a sunny, well-drained spot and moderate water. Nasturtiums are easy to start from seed and have a lovely, light peppery taste. The leaves and flowers are edible. They can be stuffed or sliced with a sharp knife into slivers and used to garnish salads, cold soups and pasta dishes. fresh herbs of choice, basil, dill, marjoram, thyme, and savory all work well. Mix the herbs and cheese together well. Gently insert a scoop of the mixture into each blossom. Serve alone or on top of dressed salad greens or your favorite pasta dish. Baby, it’s hot outside. Time for some cool, easy soup and salad fixings. From the upcoming book, The Herbalists Happy Hour. Also nice without the alcohol; the kids will love it. Add lemon, syrup, and alcohol of choice to glass, top with seltzer and ice, stir and imbibe. Add all ingredients to a saucepan, bring to a boil while stirring, turn off heat, cover, and let steep for an hour or two, strain, and refrigerate. Combine ingredients with water in a 2-quart pitcher and chill. Drink throughout the day for refreshing hydration. Put all ingredients into a blender and blend well. Enjoy! Place melon and lime juice in a blender. Process until very smooth, about 1 minute. Add the salt and refrigerate until chilled. Top each serving with a dollop of sour cream and sprinkle with the basil. Whisk dressing ingredients together. Add broccoli, radish, pepper, bacon and enough dressing to coat and stir lightly. Add avocados and gently fold in. Season and top with chopped basil or cilantro. Whisk or shake dressing ingredients together. I make all my homemade dressings in re-purposed kombucha and tea bottles. Mix all salad ingredients with the exception of the avocado together. Add dressing to coat and stir gently. Fold in avocados and enjoy! Posted in 2018, The Herb Blurb and tagged Broccoli, classes, clinical herbalist, Cocktails, colorado, colorado free events, colorado herbs, cooking, cooking class, Denver Botanic Gardens, edible, recipe, recipes.